You've likely heard of information interviews or one of its variations. Natural networking. Relationship building. Talking to strangers. Having coffee. Whether it was a college career advisor or some random career article you stumbled upon, you’ve skimmed how they can help your career. You may have even read a story about someone who got an amazing opportunity from doing one. Not next week or next month or when you “have some time.” Because if you wait until then, you know you won’t do it. So, why am I harping on informational interviews? And the beauty of informational interviews is that they can help you with all these situations (and more). You could start making progress toward your career goals this week by having just one informational interview. Plus, there is nothing keeping you from setting one up, except yourself. You don’t need special skills, you don’t have to have a degree from an ivy league school, or have parents who are close friends with “important” people. Most people take a passive approach to their careers. They send out resumes and then wait for someone to respond. They show up for work every day and wait for someone to offer them a promotion. Mostly they wait. And as many of you already know, waiting doesn’t pay off. So put yourself among the top performers and do something. Take this first step in helping yourself leave frustration, depression, and anger behind. Don’t let your 40+ year career consist of a string of awful-to-terrible jobs that prevent you from living a full and happy life. Because, like it or not, you take that crap home with you. So make today the day that you take action. The day you set aside the 20 minutes you need to ask for an informational interview. The day that you walk around just a little cockier because you did something most people won’t do. The day you realize that by taking this one extra step, you’re giving yourself an advantage most people want, but won’t have. Hopefully by now you’re ready for me to shut up about taking action and you’re ready TO DO THIS! 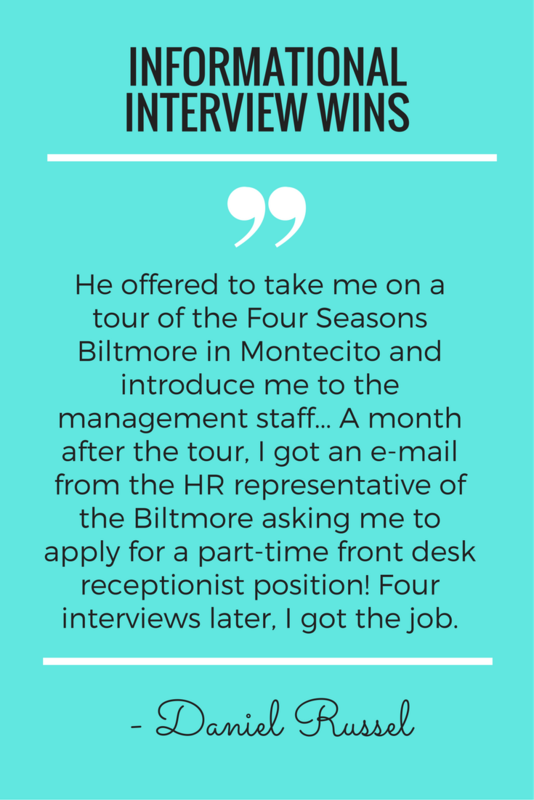 So, let’s talk about what it takes to have a successful informational interview experience. Before you can choose the person you’ll be meeting with, you need to get clear on what your goal is. You don’t want to waste your time or theirs, so consider what you want out of this interview. Are you looking for an idea of what it’s really like to do a specific job? Or are you interested in finding out more about how to land certain opportunities? Once you have a specific goal for the interview, it’s time to pick out who you’ll be talking to. You’ll want to make a list of at least 5 people who will be best able to give you the information you need. For example, if you’re looking for advice on landing an engineering position at a specific company then talking to someone in accounting at that company won’t help you much. Be as specific as you can in your criteria for choosing this person to get the best results. Once you know what you’re looking for in an interviewee, start your search. I personally like starting with LinkedIn because my network is already there and I can search for people beyond my network. But it’s not always the best option depending on your industry. So search the networks you know have the highest chance of getting you what you’re looking for. I also like to send out an email to those I have a more personal connection with (family, friends, mentors) and let them know I’m looking for someone to talk to about [insert topic]. "Go for the most immediate—and well documented—commonality: The school you went to. As Moore says, hit LinkedIn and look up your college's alumni database." If you recall, we spoke a few months ago when I was exploring new career opportunities in information security (I was your student at the time). Thanks again for agreeing to be my reference! I was browsing the Acme Career site the other day and the Research Scientist role caught my eye. I think it’d be perfect for me considering my work on insider threat-related projects at Current Company. Some of you may be reluctant to choose someone you don’t know or you can’t be introduced to. I will tell you that 8 out of 10 times, I reach out to complete strangers for interviews. I’ve received a response every time and most of the time it's led to a meeting. People you don’t know do want to help you. I know it sounds crazy, but it’s not. Think about it like this. How would you feel if tomorrow you received an email from someone asking you for advice on what to do next in their career? Would you automatically delete the email and say “screw that guy.” Or would you be secretly flattered? Maybe you would even tell the next person (or ten) about the kid who reached out to YOU for career advice. You may or may not respond to the email (things get busy), but your first reaction likely won’t be to think of this person as a pest. And if you have the time for a 20-minute call or for (a free) coffee one afternoon, you would go, wouldn’t you? So use that feeling of being flattered to your advantage. Worse case scenario, they don’t respond back. You didn’t know them well anyways, so no biggie. There are other potential interviewees in the sea. Now that you have a clear goal and a list of people to reach out to, how do you ask them for the interview? Informational interviews aren’t meant to be one-hour lunches or dinners. You want to be respectful of this person’s time and make it easy for them to say yes. So asking for 15-20 minutes typically works best. Plus, you can do a lot with a 20-minute coffee meeting. If a face-to-face meeting isn't possible, set up a call instead. I have had great results with both, so go with whatever feels most comfortable for you. I was fascinated by your latest article on Inc.com about creating a computer program that helps solve global food system issues. As an advocate for the investment in food technology, I think the work you are doing is essential to the long-term growth and prosperity of third-world nations. I would love to learn more about what inspired you to take on this project and what it is like working with investors in the food technology industry. Can I take you out for coffee at a date and time of your choosing? Or maybe a quick 20-minute chat over the phone? I understand that you may get requests like this all the time and that you can't say yes to everyone, but I do hope you will consider it. You're aching to leave that I-hope-the-building-burns-down-today job. You're struggling to answer the "what do I want to be when I grow up" question. You're grasping to find those I-can't-believe-they-pay-me-to-do-this opportunities. So go ask for an informational interview and take that first step towards a happier, less anxious you.